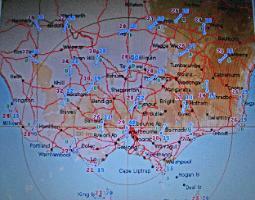 HAARP caused radar patterns across Aussie: Weather modification? trying to resolve these questions. 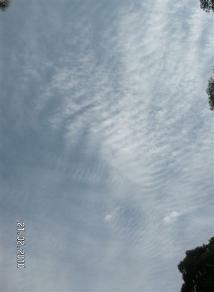 dramatic patterns only been seen continuously since January 15th, and not before? adjustment problems on radar sets. What took place today (Feb. 19th) made me decide I should post this update. INTERFERENCE AND ANOTHER NEW WEATHER SYSTEM FORMS. 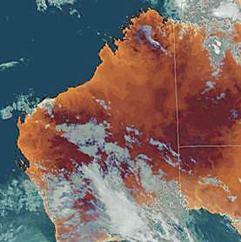 scale, and seems to be affecting the earth’s atmosphere. It must be addressed. into today, requires a full technical detailed explanation. 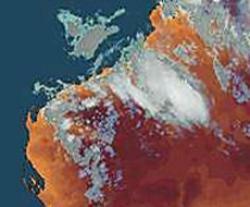 tropical storm Olga, and two human made weather systems, this is the map. 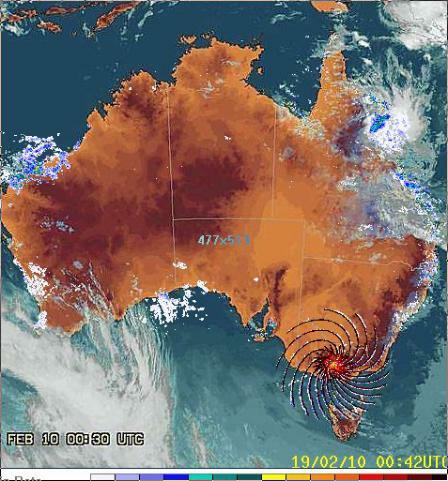 Now is someone going to explain what is going on over Australia? 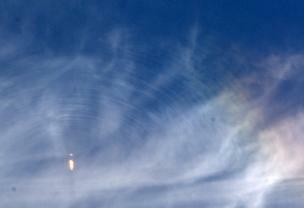 Colin Andrews - February 19, 2010.
brief high pressure spiral shared the same center - is that coincidence?. 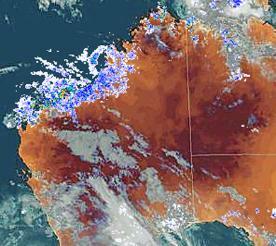 south east of the country was a man made effort to bring rains to those parts. We will see. impressive. We are not looking at some small toy here. 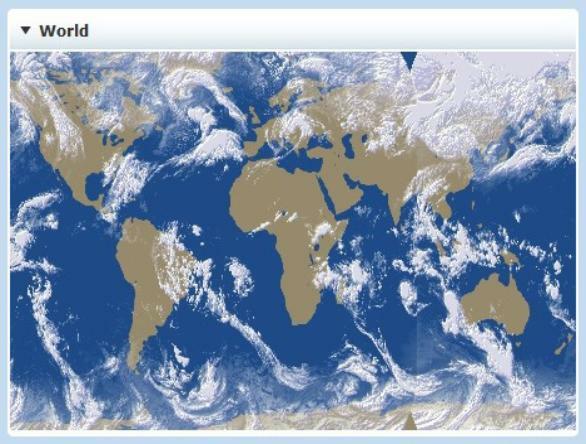 Image Copyright BBC. Rainfall Chart from 1-19 February 2010 shows most of the country have gotten some rain. 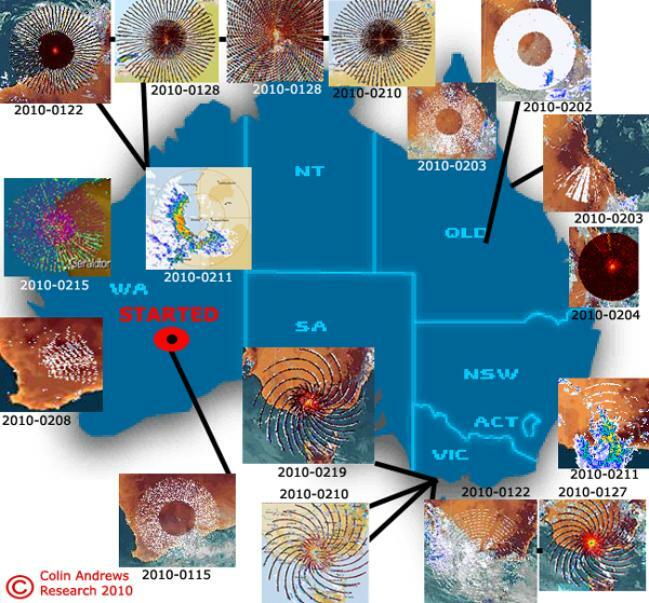 The radar patterns and locations across Australia between January 15 - February 19, 2010.
gradient force to make a trough. The counterclockwise rotation is associated with the high. so cyclonic vorticity is associated with good weather. site near the trough line. Does it cause weather (vertical motion)?? 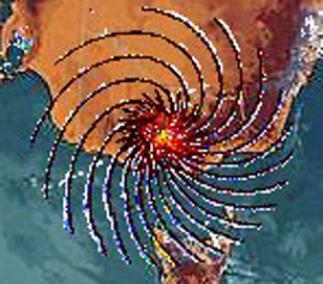 seeing during and after the radar 'flash'. proof of a vertical component? enough to send professional information and ideas would be appreciated. going on is probably not of there making. 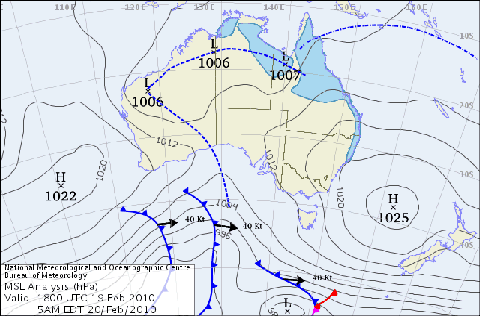 toward the high which changed the pressure gradient force to make a trough. The question here is does it cause weather (vertical motion)?? hours before the image to nine hours after. form. Is this proof of a vertical component? this particular event, what does it mean? passed, because a larger more encompassing global one did. they don't know what is going on is probably not of their making. 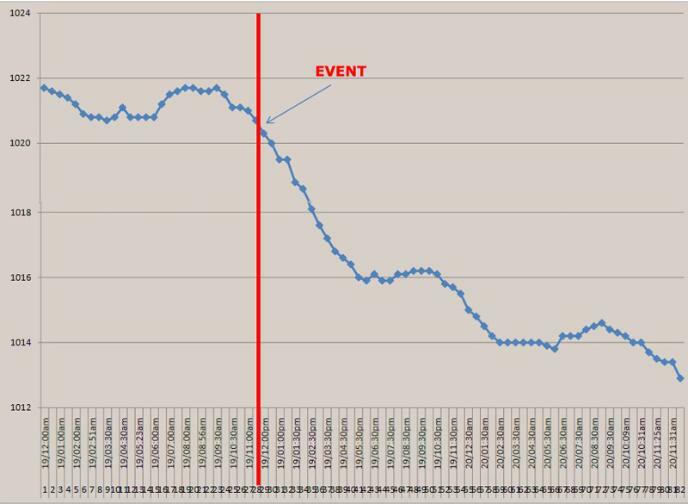 pulse of high pressure before the event and sudden reduction following it as the high moved away. Clouds over Cape York, Australia 2009. 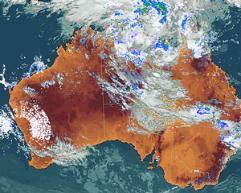 Melbourne two days later, February 21, 2010.
atmosphere and producing heavy precipitation while the satellite shows no or little cloud at all. empty skies. Others speak of no rain but violent lightning like nothing they have seen before. 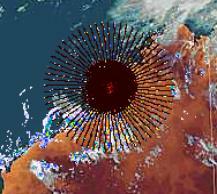 over Broome and another broken white ring from Geraldton on the west coast. radar and note cookie cutter ring quardrant. 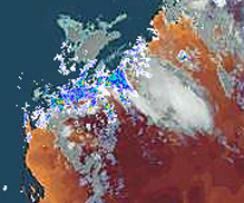 precipitation that the satellite (left) does not show. exact same period the weather dramatically shifted gears over the continent ? 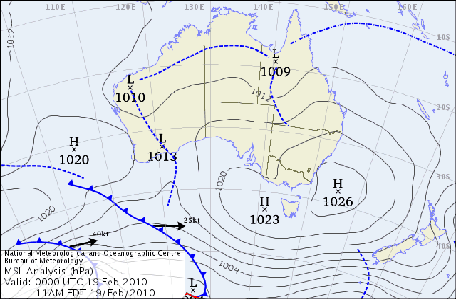 storms to cyclones, seemingly out of thin air.